I have a fantastic deal for you today from my friend Rebekah at Angelfoods.net. 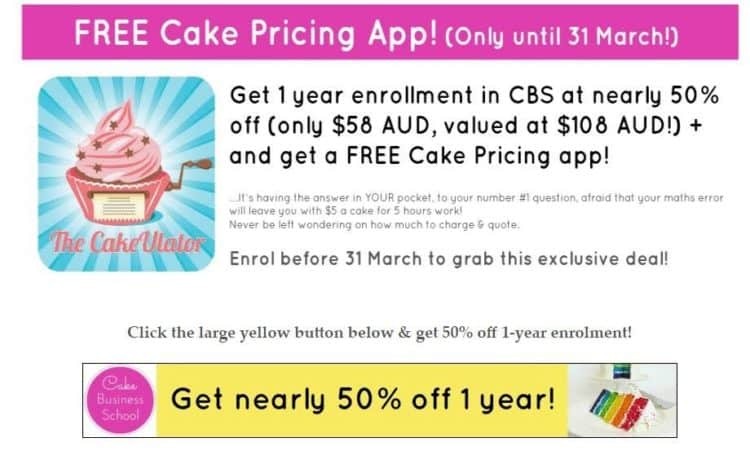 You can enroll in Cake Business School almost 50% Off + 2 FREEBIES! And one of the freebies is a FREE PRICING APP!! How awesome is that?! She is the brilliant mind behind Cake Business School and when you enroll this month (in March), you will get a FREE Cake Pricing App and a FREE ebook from me that’s never been seen! Even better… right now you can get into CBS for almost 50% off the regular price! But guys… don’t wait to jump on this deal – it’s only available for another week! If you want to know everything included with Cake Business School, please read my full review here. But the short story is – this is an amazing opportunity and CBS is loaded with valuable information. Also, Rebekah adds new information all the time to keep you up to date on all of the latest cake business trends! If you have any questions about how to grow your business… pricing, growing your client list, getting booked up, how to market your business and how to achieve your goals … well, the answer is inside CBS! Cake Business School is usually around $7 per month, but when you enroll for a full year right now, you get a full 12 months for around $44! And when you pay all at once, you won’t have money coming out of your bank account every month. Instead, it is all paid for the year and you get immediate access to CBS for 12 months! This includes more than 20 training modules in the vault and new training monthly! 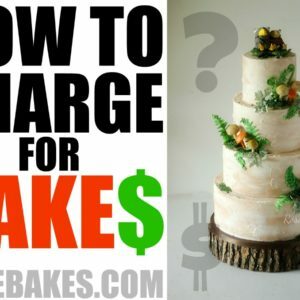 Plus the free cake pricing app and the free ebook from me (when you tell Rebekah I sent you)! Have questions? Leave me a comment! Or click here to sign up now! This offer expires on March 31, so don’t wait to take advantage of it!